For Warhammer Invasion and Board Game Players of all levels and ages! Warhammer Invasion LCG(WHI) is a Living Card Game developed by Fantasy Flight Games. 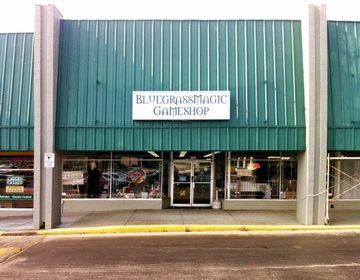 We meet Friday's at 6:30PM at BluegrassMagic GameShop. We are a friendly casual play group with monthly constructed or draft tournaments. You don't have to own any cards or know how to play to come. We would be more than happy to show you the ropes and lend you a deck to give you a feel for how it plays. If you want to know more about WHI now, click here to watch a short video overview on how to play Warhammer Invasion. Our Saturday board game nights, we'll play anything once! Board Game Madness!!! 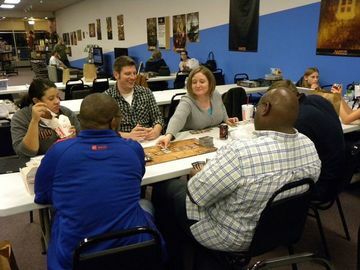 We schedule special gaming nights on 2nd and 4th Saturday of each month at 4PM for board games and deck building games like: Ascension, Thunderstone, Tomb, Arkham Horror, Twilight Imperium, Puerto Rico, Smallworld, Nightfall, Dominion, Kingsburg, Rune Wars and anything you decide to bring! If you have any suggestions or want to know more about Board Game Madness!! !, contact Logan! The ladies of the group frequently have Girls' Night Gaming, a night reserved for the ladies only where they can meetup to play board games such as: Ascension, Smallworld Underground, Puerto Rico, Race for the Galaxy, RuneBound, Munchkin Quest, Fluxx, Gloom, Infernal Contraption or anything you might want to give a whirl. What started as a few of the wives coming to Board Game Madness has spawned off onto its own event! Contact Aileen if you would have any questions or ideas pertaining to the next Girls' Night Gaming! Kids are welcome! We bring our kids to play board games amongst themselves or play Warhammer if they are up to it! Current kids attending range in age from 8 - 11, but sometimes have children as young as 1 year old. Check theKid Role Call thread on the forums to see how many kids are coming and what ages. Louisville Warhammer Invasion and Board Game Group Members-Only You do not have access to read this forum.